This past week, I’ve been having fun brainstorming my new Ten Minute Dinner Facebook page to preface the newly organized page on my site. I’ve realized at this stage in my life, more often than not, ten minute dinners are my continual “go-to” recipes. I want meals fast and easy without the cost of take out, and much healthier than fast food. 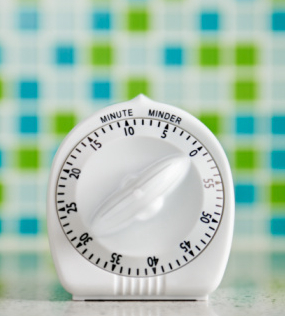 Whether it’s ten minutes from the fridge to our “feast,” or ten minutes of preparation time, life is easier when I have a plan – a ten minute dinner plan. While I do a lot of Power Cooking, C.O.S.T. (Cook Once, Serve Twice or Three Times) Cooking, Freezer meals, Crock pot dinners, and just plain easy family dinner type of recipes, I haven’t shared all of those in detail on my blog. By having a separate looking site (yet still under Balancing Beauty and Bedlam), it will help me, and others, find anything related to quick cooking in one spot. With the help of some friends and my Balancing Beauty and Bedlam Facebook readers, we came up with some great tag lines for the blog. It’s hard to wrap up what I want to communicate in just a few sentences. What would make someone check out this site or think that what I have to offer is beneficial? I am sorting through those questions as I plan, but in the process, I had some great laughs as we were brainstorming. Here are some tag lines that we came up with , but then some of you added in many more great ones on the facebook page. because tonight, I have better things to do. because if you don’t cook, no one will. because if you don’t cook, they’ll starve. because someone has to cook. because in ten minutes, they’ll be eating each other. because you can’t have PB&J at every meal. because Nutella is not a vegetable. because everyone has a few minutes in their day. because we all have to eat. So far, I think the vote has been leaning in favor of Ten Minute Dinners: because sometimes, ten minutes is all I have. 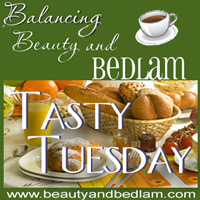 So, I am entrusting you all, my wonderful Tasty Tuesday readers, to weigh in on a few things. 1.) Do you have an amazing tag line or just a funny one to share? 2.) Until the blog is finished, I would love to invite you to participate in our Ten Minute Dinners community on facebook. I have set up a Discussions tab on the left side bar where you can add tips, and easy recipes (written out there nice and simple, and not just a link to a blog post, please.) So many of my readers don’t have blogs, and I would love to give you a place to share your ideas and ask questions as well. 3.) Submit your favorite Ten Minute Dinner recipes (with some good photos) that I will feature on the new page. They may be Ten Minutes total or Ten Minutes (or less) of preparation time, followed by cooking time. If you are a blogger, that would include a link back mentioning your site, of course. I have many pasta and chicken recipes, but I will especially be needing fish, pork and unique beef recipes. Feel free to comment on the title before you type it up first because it may be one I already have in my drafts. where should we submit 10-minute recipes w/ photos to? email you? to your FB page? Thanks! “Because Nutella is not a vegetable…” is great! Ha! I love all the taglines! Last week I linked up BBQ Ribs and that pork recipe is definitely under 10 minutes for a main dish. This week, I linked up a very easy and tasty sauteed zucchini recipe that can be prepared in a matter of minutes. Congratulations on a new site! It is definitely a needed resource in our busy lives. All the taglines were adorable!! I’m terrible at coming up with meaningful and quirky taglines or titles. I do love the idea of ten minute dinners, though!! Can’t wait to see some 10 minute meal ideas! Fun! This sounds like a great idea. Everyone needs 10-minute dinners now and then. I will be checking out your Facebook page. What a great idea! I need some new 10 minute dinner ideas. I have the hardest time coming up with things to cook for dinner (and motivation). Baking treats or making dessert…no problem….I could spend hours preparing yummy goodies. I really like the tagline Ten Minute Dinners: because sometimes, ten minutes is all I have. For a tagline, it’s reality when you have small children and work full time. Ten Minute Dinners: because in 11 minutes, the meltdowns begin.